Thinking of signing up for this class? I wrote Color Pooling Developments with you in mind. Jempool pattern. It’s the blue scarf on the left in the above photo. See all of Vashti’s color pooling projects and swatches at this self-updating Ravelry link (log in to Ravelry first to see all of them). Interested in planned pooling with crochet thread? See this handy chart I created in full resolution of some variegated Lizbeth crochet thread color sequences. Rosebud Argyle Color Pooling Stitch (row by row instructions). Newest 2018 post. Color Pooling Developments Spring 2018. Color Pooling Crochet Stitch Games-Class/Planned vs. Accidental Spring 2016. Crochet Class Yarn Sponsor: Lorna’s Laces! The Original 2016 Crochet Stitch Games: Class Resources page (see image). Color & Stitch Games inspiration board (Pinterest). Self-Shading, Long-Striping Yarns inspiration board (Pinterest). It’s the Yarn inspiration board (Pinterest). Color FX with Crochet Stitches inspiration board (Pinterest). PlannedPooling.com where you can plot the color sequences of your yarn and see how it pools based on your plan. 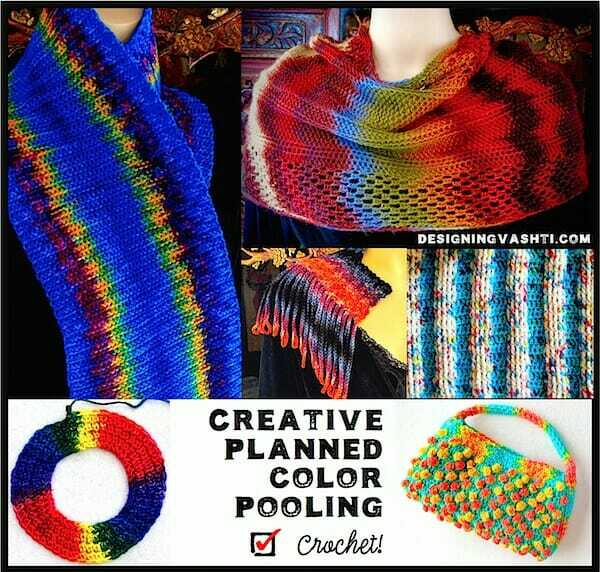 Planned Pooling With Crochet Facebook group for crocheting argyles, founded by Summer Cromartie. Especially see Brenda-Leigh Bennett’s 10/21/16 resource page there! Deborah Bagley wrote a meaty multi-part series on several kinds of planned pooling. Start with the introductory roundup of it: Hook and Learn: A Feast for Your Color Pooling Eyes. Laura Bryant: Ikat knitting effects with her ikat-style hand dyed Prism yarns, featured in Vogue Knitting. I took Laura’s pooling class at my local yarn shop and here’s my ikat attempt with slip stitch crochet. If I had to pick only ONE book to read about planned pooling, it would be her 2013 Artful Color, Mindful Knits: The Definitive Guide to Working with Hand-dyed Yarn. Marly Bird: Fantastic YouTube videos and blog posts for crochet planned pooling that argyles. Glamour4You, Sewrella, Rockin’Lola (her granny stitch argyle guest post), Naztazia: Bloggers with popular tutorials for crocheting pooled argyles. Also see Kathy Lashley‘s post, a rare one on the “lightning bolt” effect when pooling in the round, and Kinga Erdem who explains her bold zigzag argyle using just half double crochets [UK: htr]. Karla Stuebing: 2013 article, “Art and Science of Planned Pooling.” It’s about knitting but very inspiring for crochet. Wannietta Prescod: this blog post links to her earliest inspiration and to her influential Sweetspot 2009 article for Knitty. Planned pooling crochet patterns, a self-updating link: Ravelry doesn’t seem to have a category for this technique yet, so I used the keyword “pooling”. Of 23 search results it looks like 20 are true planned pooling. Of these, 17 are argyles, and most appear to be seed stitch (as of 4/16/18). Planned pooling knitting patterns, a self-updating link: as with the crochet search link above, I used a keyword search. Of the 91 results (as of 4/16/18), about 80 are true planned pooling designs. Any Books on Planned Pooling with Crochet? Found one! Yarn Pooling Made Easy by Marly Bird. Published by Leisure Arts, 2017.